Summer is almost here and so is the unbearable heat. It’s always more fun to camp when there is no rain and the sun is out but it also gets hot very fast in the campsite. Fortunately there are some great outdoor lifestyle products out there to help make summer camping more comfortable. 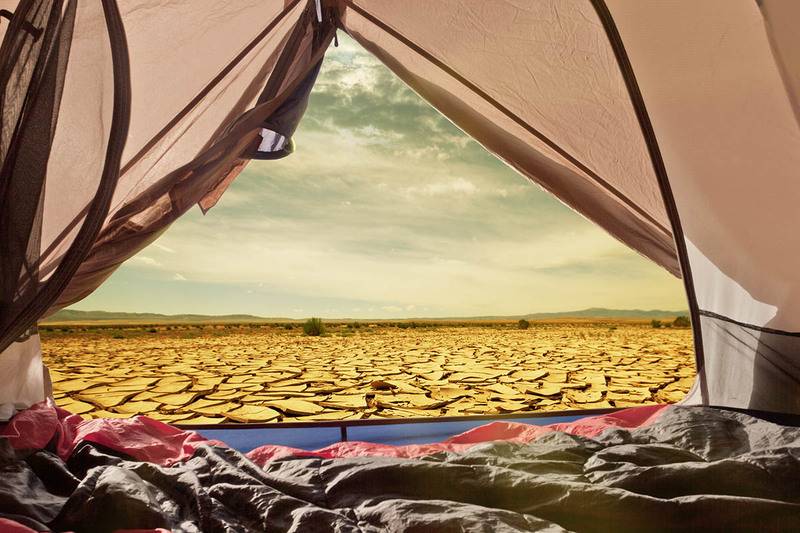 Here are a few gear suggestions to help keep you cool while camping in hot weather. Tents are great as an all-around camping shelter but hammocks can help you get a better night’s sleep in the summer. You’re suspended away from the ground so air can flow above and below your body for better cooling power. 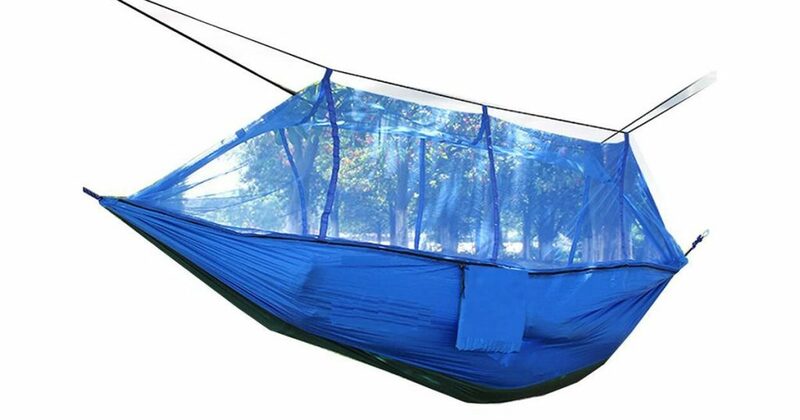 Make sure to buy a hammock with bug netting to keep mosquitoes and other insects from biting you if you plan to camp somewhere with a lot of mosquitoes or other pesky bugs. 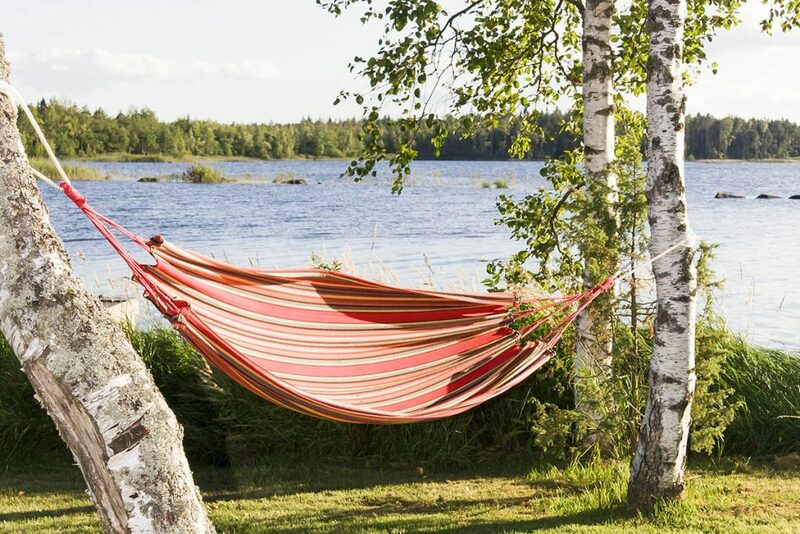 Here are a few of our favorite hammocks for summer camp outs. Grand Trunk is a popular hammock company known for their quality and large size. 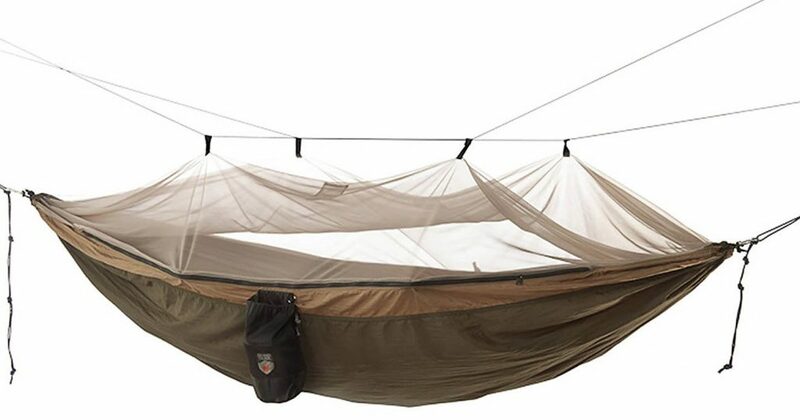 The Skeeter Beeter is a great option if you want a big hammock that will keep you bite free while you sleep. The mosquito netting is easier to set up on the Skeeter Beeter than other hammocks in it’s class and the extra size is nice if you don’t like the cramped quarters of backpacking style hammocks. The Suparee hammock is a good budget option for people who are under 6ft tall, and don’t live in a state like Florida that has the tiny, evil demons known as no-see-ums. The included netting works great to keep mosquitoes out, but it is not rated for no-see-ums. It’s relatively small size makes it easy to travel with, but it is not a really comfortable option for taller people. Setting up this hammock is really quick and easy even in the dark, so it is a great option for short to average sized people who don’t live in states with no-see-ums. The Creative Case 2 person hammock is the perfect choice if you want a lot of space for yourself or if you want a hammock that can accommodate two people. 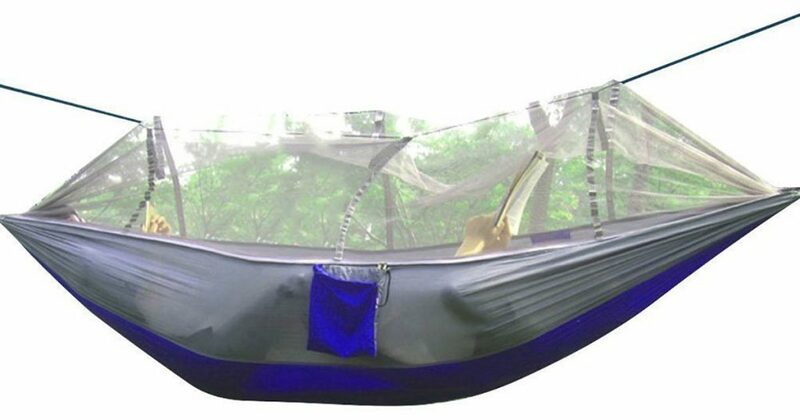 It was designed to hold two people, but if you and your significant other are tall or bigger than average it may be a bit cramped, but for the price this is a great choice sleeping under the nigh sky without bug bites. If a hammock is not an option you will need a way to keep your tent cool. Battery operated fans can make the inside of your tent cooler in the summer heat. Battery operated fans are common, but there are also rechargeable versions are a nice option in case you forget batteries. There are some pretty amazing fan options these days for outdoor enthusiasts. and they can be the difference between a hot, sweat night of tossing and turning or a cool comfortable restful night of sleeping. Here are a few of our favorite camp fans. If you read our Innovative Camping Gadgets post you know we are big fans of the Image LED Light and Fan combo for camping. It can usually be found for under $20, and it is a perfect addition to just about any tent. If your tent has a hook or loop on the ceiling the Image Fan Light can be easily attached to the roof or it can be set on the floor. The price, versatility and relatively long battery life of this product make it one of the best hot weather camp gear products you can buy. It is no surprise that Coleman makes one of the best camping fans on the market. 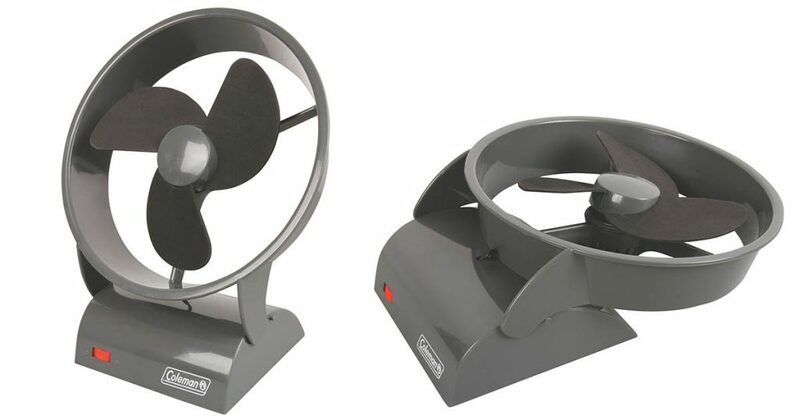 If you are looking for a powerful portable fan that will run at full strength for over 18 hours than the Coleman Tent Fan is your best choice. It doesn’t have a hook to hang from your tent ceiling but it creates more wind flow and lasts longer than most other camping fans. However it is a little larger than most other camp fans and it runs on D batteries, so if you want to stay cool on a multi day camping trip you will have to bring extra batteries, but that is a small price to pay if you need a powerful fan for for hotter climates. 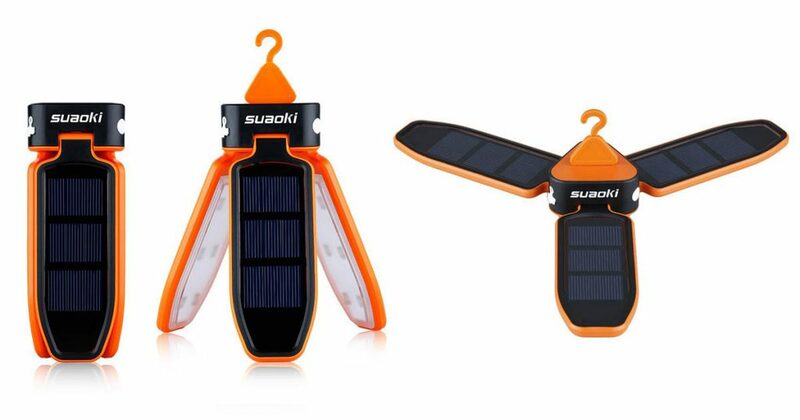 The collapsible tent lantern from Suaki is truly ingenious. It folds up incredibly small for easy transport, and it’s fan blades are embedded with LED lights that can be turned on and off separately from the fan itself. This is the perfect tent fan as long as your tent has a loop or hook in the ceiling, because it does not have a stand for floor use. The best feature of the Suaki LED Tent Fan is that it it has solar panels on the top of the fan blades, so it can be charged during the day, and you don’t have to worry about bringing enough batteries. For really hot afternoons and evenings a fan may not be up to the task of keeping you cool, and that is when you need to get water involved in your heat fighting regimen. Misters are a great way to keep cool outdoors, and there are a growing number of companies making portable misters to help fight the heat. Here are a few of our favorites. 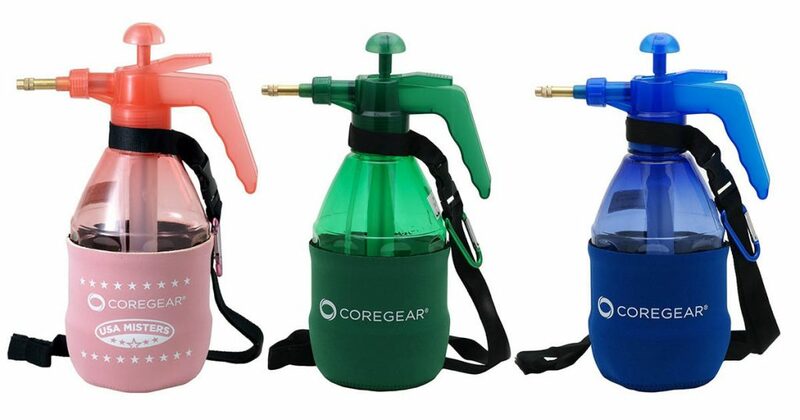 As you can see the CoreGear USA Mister comes in a variety of colors, and it is perfect for camping, because it is powered with a manual pump, so no batteries are required. It can be adjusted to spray a fine mist or a powerful stream depending on your needs, and it doubles as a water balloon filler if you decide a water balloon fight is the way you and your family or friends want to stay cool at the campsite.